The Monroe Business Community began pushing for a local bank in 1902, the year the town was incorporated, and two years later the Monroe State Bank was organized with capital stock of $25,000. 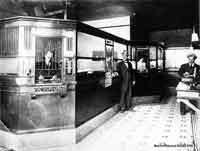 E. Milton Stephens was president when the bank opened for business on March 10, 1904, in temporary quarters in the harness shop of C.M. Bounsell & Co. By the end of the year the bank moved to a its permanent home in a handsome new brick building that still stands (the first brick building in Monroe) at 106 East Main Street. The original safe was of manganese steel, had a time lock, weighed almost two tons, and cost $1700. 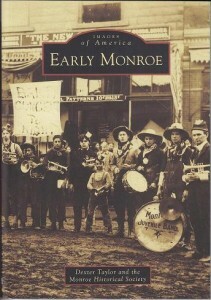 It is now in the Monroe Historical Museum. 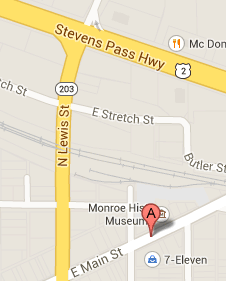 In 1909, Monroe State Bank joined the national banking system as the First National Bank of Monroe. The Monroe National Bank, the rapidly growing community’s second bank, opened on July 15, 1909, with Arthur Bailey as president. It was located in a handsome new, two story building at 107 West Main Street that still stands, and the name of the bank can still be seen set in the tile at the entrance. In 1924 a new tear gas system was installed to protect the vault from safecrackers. In 1933 during The Depression, President Roosevelt closed all the nation’s banks and had them audited. Only solvent banks reopened. The First National Bank of Monroe reopened on March 15 of that year and assumed all of the assets of Monroe National Bank, which did not reopen. Soon thereafter the First National Bank of Monroe moved into the Monroe National Bank building. On Oct. 2, 1943, the First National Bank of Monroe became the Monroe Branch of the First National Bank of Everett. On Oct. 17, 1955, the bank moved into a new building on the northwest corner of Main and Blakely Streets (now the home of Frontier Bank). On Nov. 16, 1961, Seattle First National Bank (SeaFirst) acquired the First National Bank of Everett, and in 1983, SeaFirst was acquired by the Bank of America although it remained SeaFirst in name until 1999. On Dec. 18, 1993, SeaFirst (now Bank of America) moved to its current location at US 2 and Old Owen Road. 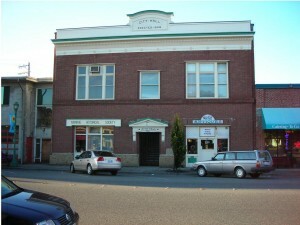 This was the site of the original Monroe branch of the Bank of Everett, which opened in 1966 making Monroe once again a two-bank town. It was acquired by Rainier Bank in 1980, which was acquired by Security Pacific Bank in 1987, which was finally acquired by SeaFirst in 1992 when it was part of Bank of America. Monroe became a three-bank town in 1968 when First Mutual Savings Bank (originally Eastside Savings and Loan Association) opened a branch in 1968 at the southwest corner of Main and Lewis Streets. It is now First Mutual Bank (as of 1999). EverTrust Bank (as of 2001) arrived in 1973 but as Everett Federal Savings and Loan Association, which became Everett Mutual Savings Bank in 1987, and then Everett Mutual Bank in 1994. Olympic Bank came to Monroe in 1979 and was then acquired by First Interstate Bank in 1985, which was acquired by Wells Fargo in 1996. First Heritage Bank opened their Monroe branch in 1986. Pioneer First Federal Savings Bank opened at branch in the Monroe Safeway in 1988, which was then acquired by Washington Mutual Bank in 1993. U.S. Bank arrived in 1992, Frontier Bank in 1995, and Coastal Community Bank in 2001. –from information compiled by Bill Wojciechowski and Nellie Robertson.